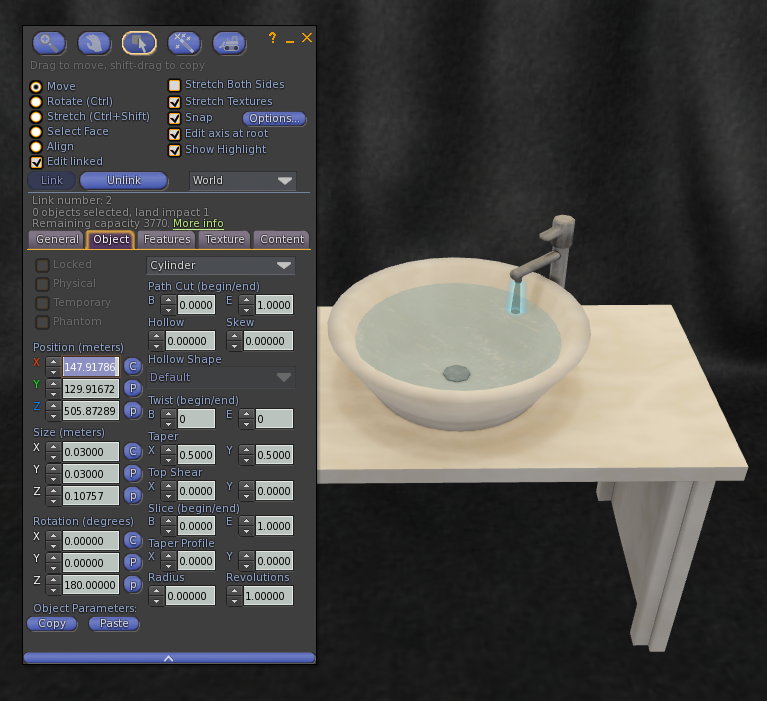 Washbasin AVsitter Plugin basic edition script in Marketplace. STEP-BY-STEP SET UP: WHAT SCRIPT TO USE? The first prim listed is the root (a mesh washbasin), and the second listed prim is a regular SL-Cylinder, with some taper. There are two prims because the animated water effect will consist in static water on the sink, plus the water falling from the faucet. 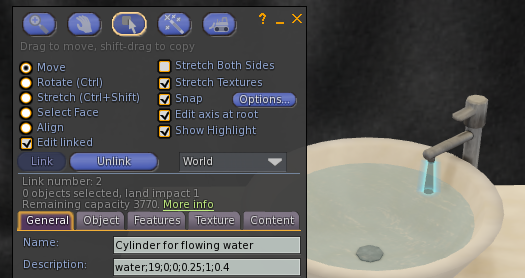 We cannot have two different animated water effects in the same prim, so we need the secondary prim, the cylinder, for this. For now, we'll just change the descriptions of the prims to something we'll say here. Once you've completed setting up the sample, please check the ANIMATED TEXTURE OPTIONS, IN DETAIL section, for details on the descriptions format. 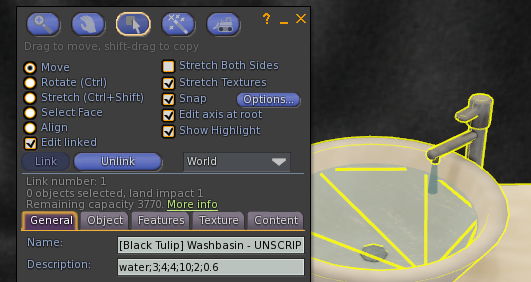 Or you can rez the next sample object, [Black Tulip] Washbasin - UNSCRIPTED SAMPLE/AVsitter in, which already has AVsitter installed, with a couple of sample poses and the AVpos notecard. We will continue by using this object. Apart than turning water on/off, the script also allows to select one sound to play among several. 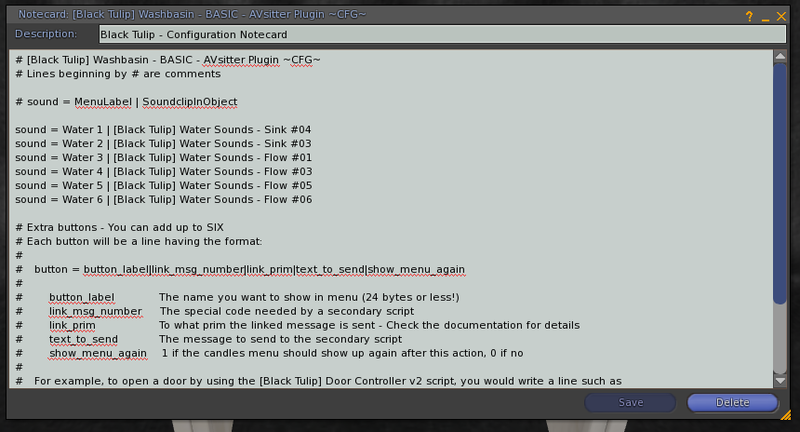 The first one defined in the configuration notecard will be the sound to be played when the script resets. After that, final users can change this from the menu. These lines define the buttons showing under the Sounds menu of the script. First, the name to show on the menu button, then, the name of the soundclip contained in the same prim where the script is. The exact format, together with all the options that can be set up in the notecard (like the extra buttons), is explained in the THE CONFIGURATION NOTECARD FORMAT, IN DETAIL section. Once we have the [Black Tulip] Washbasin - BASIC - AVsitter Plugin ~CFG~ configuration notecard ready, we would drop it in the same prim where AVsitter is, then the soundclips (with permissions correctly adjusted) if we haven't done yet, and finally, the [Black Tulip] Washbasin - BASIC - AVsitter Plugin script. There's a finished [Black Tulip] Washbasin - SCRIPTED sample object included, with all the configuration completed. You may want to check out this one if something along this process came out differently to you. In the next sections, we discuss more details and advanced options, but with this step-by-step guide, you should have the basics to start setting up your own objects, now. Although this script is designed with AVsitter in mind, because the [*To AVSit*] button will open up the AVsitter menu, the truth is that you can incorporate this script in any system that allows for linked messages. The [*To AVSit*] button is very specific, but you can open this menu from other scripts, like MLP. You have example AVpos and .MENUITEMS notecards with your purchase. Q: I click the particle/animated texture options on the menu, but no visible outcome shows. What's going wrong? A: Most likely, there's not a particles source/animated textures source defined in the object. Double-check the DESCRIPTION of the prim you expect to be a SL light point/particles source/animated texture. Q: Particles are still not showing. What happens? A: Check that you haven't deactivated particles visibility in your viewer. Q: I hear no sound when I change the volume from the menu. What could be going wrong? A: Make sure that there's a sound clip on the Content tab of the prim with the script.